Evgeniy, you had a difficult fight, how do you feel after the World Cup? – It's terrible, because it's time to rest. Although it would take a week to rest. And then a week of general exercises or such "snotty" workouts with small loads. And for me this is a torment. It's hardest for me to rest, especially after such a fight with Sasho. I need a very strong willpower to withstand these weeks, and then it will be possible to start usual workouts again. Perhaps, the category in which you pulled, was one of the most difficult in the championship. Who was the most difficult to fight with? – Yes, there were a lot of strong rivals in the category. I was very interested in fighting. I was in good shape, but still worried if it would be enough of me for all, and, apparently, in the final it was not enough. When I went to the semifinals, I already felt DOMS on both hands – the loads were enormous and even the moral forces were not enough, but I pluck up courage and continued to pull. On my left hand, I did not meet with Sasho, I think there would be a good revenge. As for Makeev, I do not think that he is stronger than Bogoslov or Sasho on the left. Although at this championship he was in his best form. He is a very fast, clever, technical and uncomfortable puller, plus every year is gaining strength. I was surprised when he struck so easily with Bogoslovov, but we all understand that if the Bogoslovov had caught him, the outcome of the fight would have been quite different. But fight is fight. You need to be ready for everything. The hardest thing was to fight Sasho, although in preliminary he seemed to me twice weaker. I do not think this is a tactic, it's probably weak point. Because is it possible to call it tactics, when he failed his left hand? I think that many people have a chance to win Sasho in preliminary, and this has been proved, just everyone overestimates him and misses his chance. In the final he is MUCH stronger. Most likely, he got tired and it was harder for him to pull with each new rival. But on the right, I went with him in the second match, he was absolutely fresh, and I did not feel good resistance, the only thing – it was hard to hold out to the pillow, but it was a matter of time. I felt like he was getting weaker, and then I was given an undeserved second foul, although I controlled the situation – I watched the elbow and stood like a dead man, but that's another conversation. Why, when I fought him in the finals, he was literally a tractor? I was ready for this, but still, it was not enough of me for just a few seconds. It was facilitated by a fight with the Bogoslovov in the semifinals. Plan A was to break through Sergey at the start, as on the left, to go out fresh on Sasho. I thought, since he sleeps starts, then I need to use it. But he got involved quickly enough and managed to catch me, then I started using plan B – this is overdoing, waiting, and the main thing is not to let him get turn into the triceps, because he is very strong there. Everything went according to plan, but we pulled a minute, and, of course, I lost a lot of strength. In general, Bogoslovov made me very worried before the competitions. I watched his workouts and saw that he lifts weights much more than mine, although I do not use small ones. Honestly, I thought I could not move him from the spot. But it was not so. Why? For me it is still a mystery. Who turned out to be like you expected, and who surprised you? – Many people surprised me in my category, for example, Petr Margarint, when he already won Bogoslovov, but the referees saw a foul. Then a sportsman from Kazakhstan – he was impressive and uncomfortable, though I did not get him, he was quickly won by Tainov in the difficult fight. Bogoslovov too, apparently, got tired quickly and every duel exhausted him. I am surprised, of course, by Ladislav Hervay, who won on the left with Sasho. 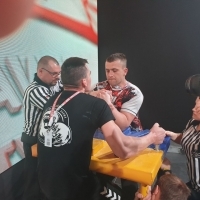 This is just the case, which proves that Sasho can be won in preliminary fights, if it was a final or semifinal the Slovak would not have a chance. How would you put Sasho Andreev, Sergey Bogoslovov and Alan Makeev on the complexity scale and why? – On the left, I think that first Sasho, then Bogoslovov, then Alan. Although Alan also won Sergey, but I believe that it would be more difficult for me to fight with the Bogoslovov. Yes, Alan is very uncomfortable, I agree, but he is not so strong and not so hardy. And if in the semi-final would be Sasho and Bogoslovov, then I'm sure that in the finals I would have to fight with Andreev, as I already told. It's a pity that this did not happen, I would like to pull with him on the left. Who, in addition to the guys you already mentioned, can you notice? – Perhaps, Jaba Getashvili, Andrey Stepanchuk, Artem Tainov, Ladislav Hervay, Irakli Gamtenadze and Raimonds Antonovichs. How do you think that was your trump card in the struggle on the left hand, and what prevented you from winning on the right? – On the left, I think that was a draw, Sasho got on Bogoslovov, Makeev lost in fouls, and I easily reached the final. In general, my left hand is well prepared, and I could fight with everyone in my weight and win, but it turned out that I did not take full advantage of my strength. My weak point was a wrist, in training I was too chasing for angles. The right is also in good shape, and I competed with lots of difficult opponents by drawing lots. The fact is that I still can not fully regain the feeling of confidence in my right hand, as it was before. A year of lack of training and then a series of losses was not very good, it all affected and knocked down the fine structure of the technique and the sharpness of the right hand. Although I showed a good result, but still the self-confidence gives the last drop, which was not enough. I still have not regained the title of the champion on my right hand. But with each competition I become more confident and stronger. And my time will come! How do you like the overall level of athletes? – The overall level of athletes is growing, and every year it is getting closer and closer in categories. I do not know what will happen next. Many strong rivals. But it only stimulates me. The more serious the level, the sweeter the medal. Eduard Dimiean: "We need a change"